Create a promotional video for a new service launch. Our company, UBS, is a new intercity travel company which has luxury seat and sleeper coaches. The video should be similar to the video attached below. Travelling between Bangalore to Chennai is stressful, time-consuming and uncomfortable. 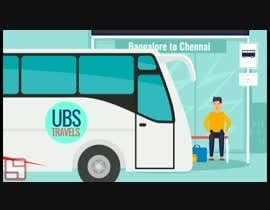 Not anymore, welcome to UBS, the premium bus service which can get you safer and quicker from/to Bangalore. Luxury sleeper / muti-axle coaches, free Wi-fi, USB charges, lip-smacking refreshments are some of the benefits of travelling with us. Starting with four services a day and stops well catered with walking distances from corporate offices and residential areas, it’s never been this easier to travel from/to Bangalore. How does it work? Book your tickets online on [login to view URL] or on our partnered sites [login to view URL], [login to view URL], [login to view URL], [login to view URL], [login to view URL] or walk in to one our booking offices. You can also reserve your tickets at no cost on our website. With UBS you can lie down and relax on well curated sleepers, enjoy our free wireless entertainment system on board and reach your home comfortable. Don’t delay book today and enjoy our seamless service. kindly check these links and feel free to contact me any time , Thanks for your time. FLC 071201 I will update my entire with different style of animation, if acceptable. I will currently use my own bus and will replace with the one that you will provide. hi site is not working , please provide logo and layout of bus !! thank you! !